The English, England – from where does the name of the language, people and land come and what does it mean? To answer this we have to travel back to the first century or two after the birth of Christ. At this point – around A.D. 100 we get the the first mention of a tribe called the Anglii in a book called Germania written by a Roman historian called Tacitus. It is believed to be a latin version of a German word Angeln. This word probably meant ‘anglular land’ or ‘peninsular’ – the part of the land they came from from all accounts looking a bit like a fish hook. 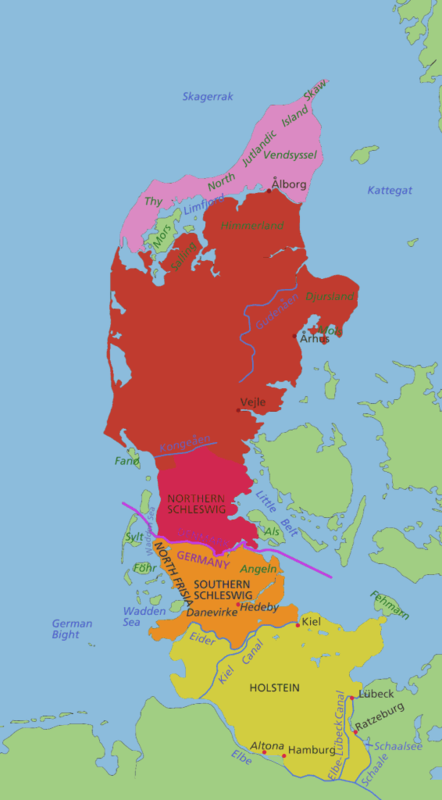 In later years Bede (the great chronicler of the rise of the English nation) writing in the 8th century identified the land of Angeln as being between the Jutes (basically modern Denmark) and the Saxons of Saxony on the Elbe river. Today a small peninsular in northern Germany is called Angeln still. Thus the original homelands of the Angles is likely to be the this small bit of land on the borders of Germany and Denmark. Interestingly Bede says that this land was depolulated by the emmigration and was unpopulated in his time. Furthermore there is almost no mention of the Angles IN EUROPE after the period of Anglo-Saxon settlement of England in the 5th to 7th centuries. For some reason – perhaps pressure from encroaching tribes from the east, pretty much the entire population may have upped sticks and crossed the North sea. Northumbria (becoming the Deirans along the Humber and Yorkshire and Bernicians around Bamburgh). This may well have been a very early phase in the 5th century. Possibly it occurred in relation to the call by the Britons for mercenaries to fight the Picts. It is possible that many Angles moved to this area when it was still under Roman control. East Anglia – where they divided into the North Folk and the South Folk from where we get Norfolk and Suffolk. Mercia – the midlands of England. Mercia means the land on the border. This was the border between the Angles and the Britons. This settlement was later than Northumbria – probably the mid 6th century. Once in Britain the Angles fought each other, the Saxon tribes and the Britons or Welsh for centuries. The Vikings would conquer much of the land and merge with the English. The road to a single people – the English would take hundreds of years and it is not until the times of Alfred the great, his sons and grandsons that we finally have kings acknowledged as king of the English. 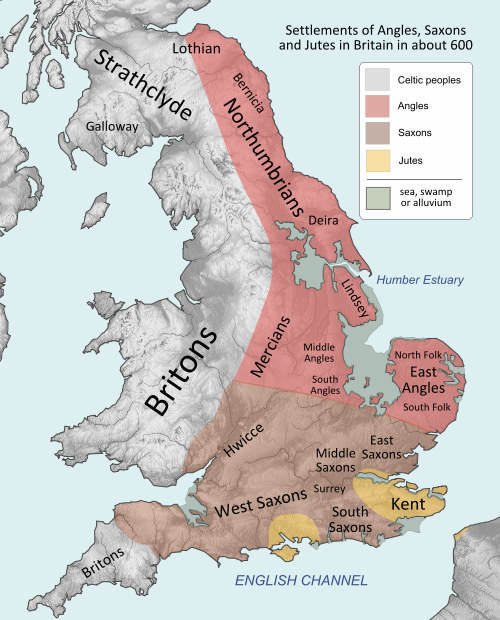 Even then much of the land we call England was under the rule of the Vikings. The names England and English corrupted over the centuries via Angeln, Angleland to England and the Angeln became the Anglish and then the English. So England is the land of the Angles – the land of the folk who came from Angeln. But there is another twist to the word. In old English place names Eng or Ing also means ‘People of’ Thus Birmingham is settlement (ham) of the people of (ing) of Beorma (a man called Beorma). So another version of England is that it means “Land of the People”. 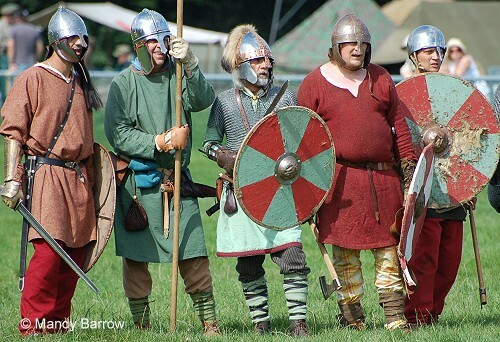 This article is linked to another – How a Knife became the name of a people where I explore the origins of the Saxons.